Objective Antidepressant use during gestation has been associated with risk of major congenital malformations but estimates can lack statistical power or be confounded by maternal depression. We aimed to determine the association between first-trimester exposure to antidepressants and the risk of major congenital malformations in a cohort of depressed/anxious women. Setting and participants Data were obtained from the Quebec Pregnancy Cohort (QPC). All pregnancies with a diagnosis of depression or anxiety, or exposed to antidepressants in the 12 months before pregnancy, and ending with a live-born singleton were included. Outcome measures Antidepressant classes (selective serotonin reuptake inhibitors (SSRI), serotonin–norepinephrine reuptake inhibitors (SNRI), tricyclic antidepressants (TCA) and other antidepressants) and types were individually compared with non-exposure during the first trimester (depressed untreated). Major congenital malformations overall and organ-specific malformations in the first year of life were identified. Results 18 487 pregnant women were included. When looking at the specific types of antidepressant used during the first trimester, only citalopram was increasing the risk of major congenital malformations (adjusted OR, (aOR) 1.36, 95% CI 1.08 to 1.73; 88 exposed cases), although there was a trend towards increased risk for the most frequently used antidepressants. Antidepressants with serotonin reuptake inhibition effect (SSRI, SNRI, amitriptyline (the most used TCA)) increased the risk of certain organ-specific defects: paroxetine increased the risk of cardiac defects (aOR 1.45, 95% CI 1.12 to 1.88), and ventricular/atrial septal defects (aOR 1.39, 95% CI 1.00 to 1.93); citalopram increased the risk of musculoskeletal defects (aOR 1.92, 95% CI 1.40 to 2.62), and craniosynostosis (aOR 3.95, 95% CI 2.08 to 7.52); TCA was associated with eye, ear, face and neck defects (aOR 2.45, 95% CI 1.05 to 5.72), and digestive defects (aOR 2.55, 95% CI 1.40 to 4.66); and venlafaxine was associated with respiratory defects (aOR 2.17, 95% CI 1.07 to 4.38). Conclusions Antidepressants with effects on serotonin reuptake during embryogenesis increased the risk of some organ-specific malformations in a cohort of pregnant women with depression. Used of large registers, administrative and clinical databases that provide population-based coverage of Quebec pregnant women, with linkage of data on the individual level. Permitted analysis of a large number of pregnant women with detailed information regarding exposure, outcomes and potential confounders, limiting selection bias. Data collected prospectively, limiting recall bias. Owing to the number of comparisons made, chance could explain some of the findings. Human studies concerning the adverse effects of antidepressant exposure during gestation on the developing fetus have showed increased risk of various congenital malformations such as cardiac, musculoskeletal, respiratory, craniosynostosis and craniofacial,5–10 but variations between study results remain.11–15 Underlying maternal depression, unaccounted potential confounders, class effect compared with antidepressant type effect or lack of statistical power could potentially explain these. Given the current debate, and the public health impact and clinical implications of prescribing and using antidepressants during pregnancy on the fetus, we aimed to study the association between first-trimester exposure to antidepressants and the risk of major congenital malformations in a cohort of depressed pregnant women. We further aimed to study antidepressant classes and types specifically as well as to quantify the risk of organ-specific defects. As some findings in other studies have been dismissed due to comparisons with a general population of pregnant women, our design allowed us to assess whether the observed rate of malformations among women on antidepressants was robust. We conducted a register-based cohort study using data from the Quebec Pregnancy Cohort (QPC). The QPC is described in Berard and Sheehy.16 Briefly, the QPC is an ongoing population-based cohort with prospective data collection on all pregnancies that occurred between January 1998 and December 2009 in the province of Quebec. Data on the mothers and children after the end of pregnancy are also collected resulting in up to 11 years of follow-up. Individual-level information is obtained from province-wide databases and linked using unique personal identifiers. The QPC was first constructed by identifying all pregnancies in the Régie de l'assurance maladie du Québec (RAMQ) and the Quebec Hospitalisation Archives (MedEcho) Databases; subsequently, first day of the last menstrual period (first day of gestation) was defined using data on gestational age, which was validated against ultrasound measures in patients' charts.17 Prospective follow-up was available from 1 year before the first day of gestation, during pregnancy and until December 2009. The QPC data sources for this study included the medical service database (RAMQ: diagnoses, medical procedures, socioeconomic status (SES) of women and prescribers), the Quebec Public Prescription Drug Insurance Database (drug name, start date, dosage, duration), the Hospitalisation Archive Database (MedEcho: in-hospital diagnoses and procedures) and the Quebec Statistics Database (Institut de la statistique du Québec (ISQ): patient socio-demographic information, birth weight). To be eligible for this study, pregnancies from the QPC meeting the following inclusion criteria were considered: (1) pregnancies with continuous prescription drug insurance coverage of at least 12 months before the first day of gestation and during pregnancy, (2) pregnancies with a diagnosis of depression and/or anxiety with or without concomitant related disorders (see online supplementary table S1), and exposed to antidepressants in the 12 months before pregnancy (see online supplementary table S2) and (3) pregnancies ending with a live-born singleton. Given that multiplicity is associated with congenital malformations, we only considered singleton births. As we wanted to have a sample of depressed/anxious women diagnosed before pregnancy, we only considered those who had a diagnosis or were treated with antidepressants in the year before their pregnancy, which increased the specificity of the diagnosis and enabled us to take into account maternal indication per design. This allowed us to determine whether the observed rate of malformations among women on antidepressants was robust and independent of maternal depression status, and adjust for unmeasured confounders by design such as consumption of alcohol, smoking rates and folic acid intake. Within this predefined cohort of depressed/anxious pregnancies, we further considered pregnancies that were exposed to only one type of antidepressants or non-exposed to antidepressants during the first trimester of pregnancy. This excluded pregnancies with multiple different antidepressant exposures during organogenesis, which are likely to be at increased risk of adverse pregnancy outcomes; this resulted in very few excluded pregnancies because the total number of combined antidepressants (AD) uses or switches were small, and therefore individual cells (eg, specific types of combinations) did not allow analyses. We excluded pregnancies exposed to known teratogens during the first trimester of pregnancy according to Briggs et al18 and Kulaga et al,19 and pregnancies with newborn diagnoses of chromosomal abnormalities. We further excluded pregnancies resulting in minor malformations alone in newborns. This was done because minor malformations are likely diagnosed selectively (leading to outcome misclassification), and chromosomal abnormalities are likely not related to the drug of interest. All pregnancies meeting eligibility criteria were analysed. This is a longitudinal prospective cohort study. We identified prescription fillings for any AD dispensed to women in the study cohort from the Quebec Public Prescription Drug Insurance Database, with the timing of exposure determined by the dispensed date and duration of prescription. The relevant exposure time window was the first trimester (0–14 weeks of gestation) confirmed by ultrasound. Hence, pregnancies with prescriptions filled during the first trimester or prescriptions filled before pregnancy but with duration overlapping the first day of the last menstrual period were defined as exposed. Primary analyses considered first-trimester exposure according to antidepressant classes. Therefore, four mutually exclusive active comparison groups were defined: SSRI, SNRI, TCA and other AD (see online supplementary table S2 for codes of all antidepressants studied). Secondary analyses considered eight mutually exclusive active comparison groups: monotherapy exposure to (1) paroxetine, (2) sertraline, (3) citalopram, (4) fluoxetine, (5) fluvoxamine, (6) venlafaxine, (7) TCA (amitriptyline, desipramine, doxepin, imipramine, nortriptyline, trimipramine, clomipramine) and (8) other antidepressants (AD; L-tryptophan, trazodone, bupropion, moclobemide, buspirone, mirtazapine) during the relevant time window. For all analyses, the reference category was defined as pregnancies with no exposure to any antidepressants during the time window of interest; the reference category was therefore depressed/anxious pregnant women that were not using any antidepressants during the first trimester, hence depressed untreated with antidepressants (SSRI, SNRI, TCA or others). Data on prescription fillings have been validated (overall exposures, and exposure to AD specifically) and compared with maternal reports, which are more reliable than data on medication prescribing in medical charts; the positive predictive value of prescription drug data in the cohort was found to be at least 87% (95% CI 70% to 100%) and the negative predictive value was at least 92% (95% CI 86% to 98%).20 The relevant exposure time window was the first trimester confirmed by ultrasound. Major congenital malformations diagnosed in the first year of life were identified in the RAMQ and MedEcho databases and defined according to International Classification of Diseases (ICD)-9 codes and ICD-10 codes (see online supplementary table S3). ICD-9 and ICD-10 codes of major congenital malformations in the QPC have been validated against patient charts. The positive predictive value of major congenital malformations diagnosed in the first year of life in the QPC have been found to be at least 80% and the negative predictive value 93%.21 All organ systems were considered and defined according to the European Registration of Congenital Anomalies and Twins (EUROCAT) Registry.22 Detection in the first year of life was accounted for to allow for late detection as well as negative confirmatory diagnoses. Patients were involved in this study by providing their healthcare data as well as their children's. The development of the research question and outcome measures were informed by patients' and healthcare providers' priorities. Results will be disseminated to the lay public during open seminars and in the media. Within the study cohort, we conducted separate analyses for overall major congenital malformations, and for each organ system malformation. The unit of analysis was a pregnancy. Potential confounders were considered for all analyses if they were risk factors for congenital malformations or makers of disease severity: (1) socio-demographic variables including maternal age, maternal marital status, welfare status, education level and place of residence on the first day of gestation; (2) maternal chronic comorbidities during the 12 months prior to pregnancy including hypertension (chronic and pregnancy-induced in previous pregnancies), diabetes (mellitus and gestational in previous pregnancies) and asthma. The previous conditions were identified from either diagnoses or disease-specific medications (see online supplementary table S4). History of depression, anxiety and other mental disorders were taken into account per design in our cohort definition of depressed pregnant women given that this was an inclusion criterion (see online supplementary tables S1 and S2 for codes and medication list used). In order to further adjust for potential indication bias, we also considered healthcare utilisation during the 12 months prior to and during the first trimester including visits to a psychiatrist; hospitalisations or emergency department (ED) visits; the number of other medication uses including benzodiazepines; and number of different prescribers. Frequencies or means, stratified by exposure study groups, were calculated for all potential confounders using χ2 and t-test statistics, respectively. In addition, prevalence of maternal depression or anxiety, gestational use of antidepressants and diagnoses of major malformations within the overall QPC (and not only in the study population), stratified by calendar year of follow-up, were calculated; trend were tested using the Cochran-Armitage Trend Test. Crude and adjusted ORs (aORs) with 95% CIs were calculated for each outcome separately using generalised estimating equation (GEE) models, which take into account multiple pregnancies per women during the follow-up period. Further, 99% CIs were calculated using GEE models to determine the robustness of the findings. For all analyses, the reference category was depressed/anxious pregnant women who were not taking any antidepressants during pregnancy. Although our data on medication exposures and congenital malformations have been validated,17 ,21 we performed probabilistic sensitivity analyses (proposed by Lash and Fink23 and the SAS macro provided by Fox et al24) to quantify the likely effects of misclassifications of exposure and outcome. For the exposure, we assumed a non-differential sensitivity analysis. The trapezoidal distributions for sensitivity and specificity with non-differential exposure misclassification were defined with a minimum of 75%, modes 85% and 95%, and a maximum 100%. For the analysis on the outcome misclassification, we used a differential sensitivity analysis and a separate trapezoidal distribution for exposed and unexposed pregnancies. Among exposed pregnancies, the sensitivity and the specificity were selected from trapezoid distributions with a minimum of 75%, modes 85% and 95% and a maximum of 100%. Among the unexposed pregnancies the trapezoidal distribution for sensitivity and specificity were defined with a minimum of 70%, modes 80% and 90% and a maximum of 95%. The correlation between the two sensitivity and specificity distributions was fixed at 0.8. Statistical analyses were performed using SAS (SAS Institute, V.9.2, Cary, North Carolina, USA). 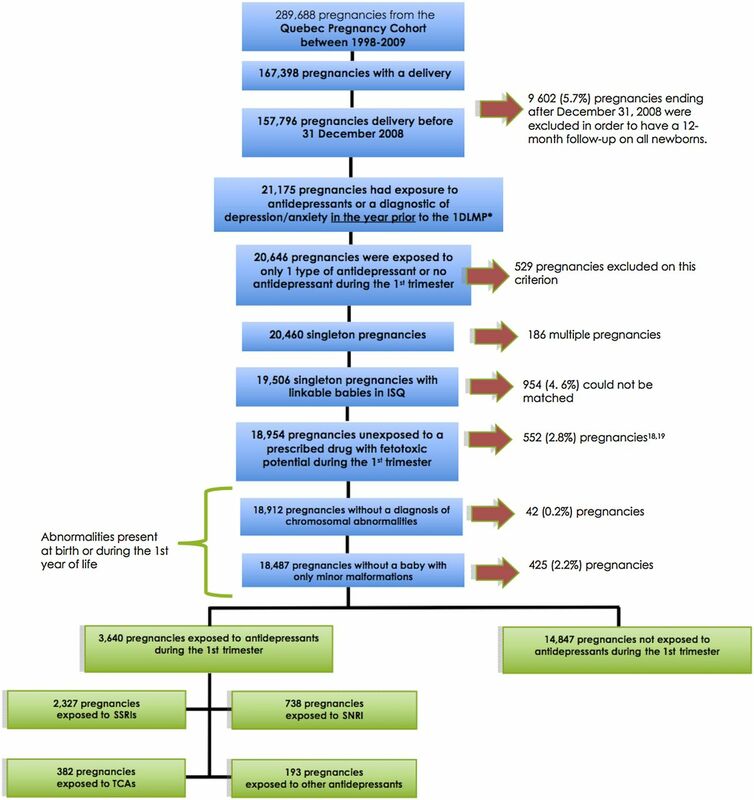 Of the 289 688 women in the QPC (figure 1), 18 487 pregnant women met inclusion criteria, and were thus considered. Before exclusions, the prevalence of maternal depression was 7.3% (21 175 pregnancies) (figure 1). The main reasons for exclusions were postnatal follow-up of <12 months for children (needed to assess the presence of malformations), use of more than one antidepressant during the first trimester, multiple birth, exposure to feto-toxic medications and newborns with chromosomal abnormalities or minor malformations alone; we were not able to link mothers with their newborn in 4.6% of eligible pregnancies (figure 1). Compared with women that were excluded, the study population was slightly younger and less likely to be on welfare (see online supplementary table S5); a description of women excluded due to exposure to feto-toxic drugs is presented in supplementary table S6. Overall, 18 487 women constituted the study population; 3640 were exposed to antidepressants during the first trimester. Among users of antidepressants, 2327 (63.9%) were exposed to SSRIs (1132 were exposed to paroxetine, 365 to sertraline, 584 to citalopram, 191 to fluoxetine, 55 to fluvoxamine), 738 (20.3%) to SNRI (all users of venlafaxine), 382 (10.5%) to TCA (318 of TCA users were on amitriptyline) and 193 (5.3%) to other antidepressants (figure 1). Antidepressant users were exposed for a mean duration of 47.0 days (SD=17.0) during the first trimester of pregnancy. The mean exposure duration was 51.0 days (SD=27.3) among SSRI users and 49.9 days (SD=33.1) for non-SSRI antidepressant users. Flow chart of the selection of the study cohort. *First day of the last menstrual period. SSRIs included citalopram, sertraline, paroxetine, fluoxetine and fluvoxamine; SNRI included venlafaxine; TCAs included amitriptyline, desipramine, doxepin, imipramine, nortriptyline, trimipramine and clomipramine; other antidepressants included: tryptophan, trazodone, buspirone, moclobemide, bupropion and mirtazapine. SNRI, serotonin–norepinephrine reuptake inhibitor; SSRI, selective serotonin reuptake inhibitors; TCA, tricyclic antidepressants. Over the more than 10-year span of the study, the prevalence of antidepressant use during pregnancy has doubled (21 per 1000 pregnancies to 43 per 1000 pregnancies) (p<0.001) within the QPC; that coincided with an increase in the prevalence of maternal depression (p<0.05) and major congenital malformations (p<0.001) (figure 2). Trend in the use of antidepressants, maternal depression/anxiety and prevalence of major congenital malformations in the overall Quebec Pregnancy Cohort. MCM, major congenital malformations. Table 1 presents the socio-demographic, medical history and healthcare utilisation in the year prior to pregnancy for those exposed and non-exposed to antidepressants during the first trimester, stratified by classes; table 2 presents pregnancy characteristics by antidepressant types. Although the study cohort included depressed or anxious mothers, antidepressant users were older, more likely to be living alone and be welfare recipient (table 1). Users had more comorbidities (diabetes, hypertension, asthma), and more health services usage. Of note, antidepressant users were comparable to non-users with regards to emergency department visits and hospitalisations, and SSRI and SNRI users were similar to non-users with regards to the number of psychiatrist visits in the year before pregnancy, suggesting similar mental health severity (table 1). Antidepressant users had lower weight newborns than non-users (p<0.001). Some variations in patient characteristics were observed between users of different antidepressant types (table 2) but they were consistent with what has been reported in table 1. Table 3 presents the crude and adjusted estimates for the association between the use of antidepressant classes during the first trimester and the risk of overall major congenital malformations; table 3 also presents the adjusted estimates compared with non-use. Adjusting for potential confounders, use of SSRI, SNRI, TCA or other antidepressants were not associated with an increased risk of major malformation, compared with non-use in our study population of depressed pregnant women (table 3). Table 4 presents the use of antidepressants and the risk of organ-specific defects, stratified by types. When looking at the specific types of antidepressants used during the first trimester, only citalopram was statistically significantly increasing the risk of major congenital malformation overall (aOR 1.36, 95% CI 1.08 to 1.73; 88 exposed cases), although there was a trend towards increased risk for the most frequently used antidepressants (table 4). Further analyses on organ system defects showed that antidepressants with serotonin reuptake inhibition effect (SSRI, SNRI, amitriptyline (the most used TCA)) were increasing the risk of certain organ-specific defects (table 4). When adjusting for potential confounders in our models and for maternal depression per design, paroxetine use during pregnancy was associated with an increased risk of cardiac defects (aOR 1.45, 95% CI 1.12 to 1.88; 39 exposed cases) and ventricular/atrial septal defect (aOR 1.39, 95% CI 1.00 to 1.93; 23 exposed cases); citalopram use during the first trimester of pregnancy was associated with an increased risk of musculoskeletal defects (aOR 1.92, 95% CI 1.40 to 2.62; 46 exposed cases) and craniosynostosis (aOR 3.95, 95% CI 2.08 to 7.52; 11 exposed cases); TCA use during pregnancy was significantly increasing the risk of eye, ear, face and neck defects (aOR 2.45, 95% CI 1.05 to 5.72; 6 exposed cases), and the risk of digestive defects (aOR 2.55, 95% CI 1.40 to 4.66; 12 exposed cases); and venlafaxine use during early pregnancy was associated with an increased risk of respiratory defects (aOR 2.17, 95% CI 1.07 to 4.38; 9 exposed cases). Given that the most used TCA was amitriptyline, the overall results are showing that antidepressants with effects on serotonin reuptake during embryogenesis are increasing the risk of overall and organ-specific malformations although statistical significance is not achieved in all instances. Online supplementary table S7 presents organ-specific estimates using 99% CI to assess robustness of estimates. Results on citalopram remained statistically significant. However, all other findings were non-statistically significant using 99% CIs. Our sensitivity analyses on overall major congenital malformations have shown that our study results are robust (see online supplementary table S8). Indeed, taking into account potential misclassification of exposure and outcome, result in higher estimates of risk than what we have presented. Hence, our findings are conservative. Online supplementary table S8 show the non-differential probabilistic sensitivity analyses for antidepressant exposure misclassification; 95% simulation limits of 0.99 and 1.25, with a median (OR) of 1.11 for the conventional method, 1.09 to 4.11 with a median (OR) of 1.23 for the sensitivity analysis. Finally when the random error was added, the 95% simulation limits was 1.04 to 4.03 with a median (OR) of 1.25. The differential probabilistic sensitivity analysis for major congenital malformation misclassification gave us a 95% simulation limit of 0.99 and 1.25, with a median (OR) of 1.11 for the conventional method; simulation limits of 0.43 to 55.15 with a median of 3.70 (OR) for the sensitivity analysis (see online supplementary table S8). When the random error was added, the 95% simulation limits was 0.43 to 54.06 with a median (OR) of 3.72. To the best of our knowledge, our study is one of a few to specifically investigate the risk of major malformations associated with the use of antidepressant types during the first trimester of pregnancy in a cohort of depressed pregnant women; we are also the first to investigate the effect of antidepressants with serotonin reuptake inhibition as a group. We found that women using serotonin inhibitors during the first trimester, including SSRIs, SNRIs and some tricyclics, were at risk of having a child with cardiac, musculoskeletal, craniofacial, digestive and respiratory defects as well as craniosynostosis. Given that indication bias can be of concern in pharmacoepidemiological studies,25 using a group of depressed/anxious pregnant women not using antidepressants as a reference category enabled for the adjustment of the indication (depression/anxiety) and lifestyles that are associated with the underlying indication (smoking, alcohol use) per design. Although our data on antidepressant use and major malformations have been validated,17 ,21 our sensitivity analyses further show that our findings are valid and underestimate the true association. Our findings are in agreement with previous studies with regards to overall major congenital malformations.5–7 ,29 ,30 These studies are similar to ours in terms of data source, time window of antidepressant exposure (first trimester) and congenital malformation detection (first year after birth). However, they used the general population as reference category,7 ,29–30 and although a group of women who had discontinued their SSRI before pregnancy was studied in Jimenez-Solem et al,30 they were allowed to switch to other antidepressants during gestation, thus not enabling for the adjustment for untreated depression per design. Our findings for paroxetine and cardiac malformations are coherent with others. Indeed, Wemakor et al,31 Oberlander et al32 and Ban et al12 found that redemptions of SSRIs during early pregnancy was associated with a doubling of the risk of septal heart defects (OR ≥2.0). More specifically, Wurst et al33 (OR 1.46, 95% CI 1.17 to 1.82), Furu et al34 (OR 1.30, 95% CI 0.96 to 1.75) and Bérard et al35 (OR 1.28, 95% CI 1.11 to 1.47) have all shown that paroxetine use during the first trimester of pregnancy was increasing the risk of cardiac defects. Findings on sertraline from Berard et al10 have been replicated in this study although the CIs do not reach statistical significance. The different inclusion criteria and exposure groups considered in the statistical analyses can partly explain this. This provides additional strength to the likelihood that there is little confounding by indication in relation to evidence of malformation prevalence with first trimester antidepressant use. We were not able to replicate some previously reported findings. More specifically, associations between venlafaxine and anencephaly, cleft palate and gastroschisis,38 and citalopram and urinary system and digestive system defects,12 or eye defects.30 This could partly be explained by the different patterns of antidepressants use in our study cohort compared with others, lack of statistical power, or adjustment for different confounders between studies. Study strengths include the use of large registers, administrative and clinical databases that provide population-based coverage of Quebec pregnant women, with linkage of data on the individual level; this permitted analysis of a large number of exposed pregnancies with detailed information regarding exposure, outcomes and potential confounders, limiting selection bias. Exposure data and major congenital outcomes have been validated against maternal report (medication data) and medical charts (major congenital malformations).20 ,21 Furthermore, although it is true that this does not necessarily mean that women actually took their medications, De Jong et al39 reported that 94% of all drugs dispensed to pregnant women are actually taken. In addition, given that antidepressants are given on a continuous basis and over extended periods of time, and that women in our study took their antidepressants for 50 days on average during the first trimester of pregnancy, increased the likelihood that they were exposed during the appropriate time window of interest (organogenesis). Gestational age has been validated,17 decreasing exposure misclassification bias for the studied time window of interest. Although data on the specific indications for antidepressant use was not available, only pregnant women with either a diagnosis of depression, anxiety or use of antidepressants in the year before pregnancy were studied to control for indication bias per design and to increase the specificity of the diagnosis before pregnancy; depressed untreated pregnant women were therefore used as the reference category. Data in our study were collected prospectively, limiting recall bias. Limitations include missing information on potentially important confounders such as smoking, folic acid intake and alcohol intake. Although we could not adjust for these variables specifically, we adjusted for these per design by studying only depressed/anxious pregnant women. Indeed, all these variables are associated with depressive status16 regardless of antidepressant use. Given that it may take many months before obtaining an appointment to a psychiatrist in Quebec, data on psychiatrist visits were used as a proxy for severity of disease rather than presence of depression; diagnoses of depression with or without antidepressant use is a better suited definition for the presence of depression, which was used in this study. Of note, SSRI and SNRI users were similar to non-users with regards to the number of visits to psychiatrists in the year before pregnancy. Although residual confounding by severity of depression could remain in our study, our findings are consistent with others published in general cohorts of pregnant women, suggesting that depression or markers of severity of depression are not important risk factors for major malformations. Even if our estimates are based on high numbers of exposed cases, we cannot eliminate increased risk in analyses on specific malformations due to lower statistical power for some organ-specific groups. Indeed, depending on the specific organ and antidepressant type analysed, the post hoc statistical power ranged from 28% to 86%. In addition, given the number of comparisons made in this study, we cannot rule out the fact that some of our findings could have occurred by chance alone. Nevertheless, many of the statistically significant associations we found have been reported by other authors before, decreasing the possibility of chance finding. Furthermore, findings on citalopram are robust as shown when calculating wider CIs (99% CI). This is less of an issue for paroxetine given that findings from our study have replicated estimates already published in other studies. Only singletons were considered due to the fact that singleton and multiple pregnancies have different risk factors for adverse pregnancy outcomes. Although it would have been interesting to study multiple births separately, <1% of our sample was excluded because of this criterion. Only live-borns were considered, as is the case in all studies like ours. However, it is known that antidepressants are increasing the risk of spontaneous abortions.40 ,41 As spontaneous abortion is a determinant of severe malformations,25 our results are likely underestimates of the true risk. Given the general awareness on the risk of major malformations associated with antidepressant use during pregnancy, detection bias could be an issue. Nevertheless, the fact that only depressed women were studied here decreases this likelihood. Indeed, Bar-Oz et al42 showed that depressed pregnant women and their children have similar number of ultrasounds during and after pregnancy. Our major congenital malformations population prevalence may seem somewhat higher than the routinely reported 3–5%, but in fact our rate is consistent with what is expected in the province of Quebec, due to high concentration of genetic risk factors stemming from the ‘founding’ French ancestors.43 Nevertheless, given that the baseline rate of major congenital malformations is similarly higher in those taking antidepressants versus non-users in our study, it has no impact on the internal validity of our study because it cancels out when comparing the exposed and unexposed groups. Finally, as we considered pregnant women insured by the prescription drug insurance programme, generalisability of results to those insured by private drug insurance could be affected. However, validation studies have shown that pregnant women receiving medication insurance from Quebec's public system have similar characteristics and comorbidities to those who have private medication insurance. Although SES might differ between the two groups, it does not affect internal validity given that all have similar SES status.44 Similarly, although the study population slightly differed from pregnancies not meeting eligibility criteria in terms of SES, this does not affect interval validity. In this population-wide cohort study, we found that infants were at an increased risk of cardiac, musculoskeletal, craniofacial, digestive and respiratory defects as well as craniosynostosis from in utero exposure to serotonin inhibitor drugs (SSRI, SNRI and some TCAs). Given that an increasing number of women are diagnosed with depression during pregnancy, these results have direct implications on their clinical management. This is even more important given that the effectiveness of antidepressants during pregnancy for the treatment of the majority of cases of depression (mild to moderate depression) have been shown to be marginal.45 Hence, the need for caution with antidepressant use during pregnancy is warranted and alternative non-drug options should be considered.
. Pharmacotherapy of depression. 2nd edn. Springer, 2011:34.
. Drugs in pregnancy and lactation. 9th edn. New York: Lippincott William & Wilkins, 2011.
. Can we rely on pharmacy claims databases to ascertain maternal use of medications during pregnancy? Pharmacoepidemiol Drug Saf 2013;22:155.
. Serotonin and morphogenesis. Transient expression of serotonin uptake and binding protein during craniofacial morphogenesis in the mouse. Anat Embryol (Berl) 1993;187:75–85.
. Major congenital malformations following prenatal exposure to serotonin reuptake inhibitors and benzodiazepines using population-based health data. Birth Defects Res B Dev Reprod Toxicol 2008;83:68–76.
. Exposure to prescribed drugs in pregnancy and association with congenital malformations. Obstet Gynecol 1981;58:336–44.
. Improvement of drug exposure data in a registration of congenital anomalies. Pilot-study: pharmacist and mother as sources for drug exposure data during pregnancy. EuroMAP Group. Europen Medicine and Pregnancy Group. Teratology 1999;60:33–6.
. Regional variations in the prevalence of major congenital malformations in Quebec: the importance of fetal growth environment. J Popul Ther Clin Pharmacol 2015;22:e198–210.
. Validity of perinatal pharmacoepidemiologic studies using data from the RAMQ administrative database. Can J Clin Pharmacol 2009;16:e360–9. Previous presentation This research was presented in part at the 55th Annual Scientific Meeting of the Teratology Society, Montreal, Canada, 27 June to 1 July 2015. Contributors AB contributed to the study design, data collection, analysis of data and preparation of the final document. J-PZ contributed to the study design, data collection, analysis of data and preparation of the final document. OS contributed to the study design, data collection, analysis of data and preparation of the final document. All authors read and approved the final document. Funding This study was supported by the Canadian Institutes of Health Research (grant number 132750). AB is the recipient of a research chair from the Fonds de la recherche du Québec—Santé (FRQ-S). J-PZ is the recipient of a Quebec-China, postdoctoral fellowships from the Canadian Institutes of Health Research. Competing interests AB is a consultant for plaintiffs in litigations involving antidepressants and birth defects. All authors have completed the ICMJE uniform disclosure form. Ethics approval The study was approved by the Quebec Data Access Agency and the CHU Sainte-Justine Institutional Review Board (#1740 and #2976).